Jesus’ calling of fishermen has struck me afresh as I’ve read Luke 5:1-11 with inmates in Skagit County Jail and Washington State Reformatory and our faith community at Tierra Nueva. Before reading aloud the text, I introduce the topic of shame, and ask people to describe situations where they experience shame. I define shame as the feeling of being irreparably faulty and visibly lacking—like a beat up car that has so many things wrong that it beyond repair. We read together Luke 5:1, which describes Jesus as standing by the lake of Gennesaret surrounded by a crowd of listeners. The men are intrigued that Jesus is not teaching in an official religious location but outside in nature, at the job site of fishermen who are men at the margins of Galilee, which is already at the margins of Israel. Jesus goes to where people are, not expecting them to come to him or to religious places. Jesus’ entrance into the world of ordinary, working-class people has inspired me over and over, and most notably when I was first called into ministry. This inspired Gracie and my move to Honduras to work with peasants in their fields and homes, and our move to Skagit County 21 years ago to ministry to migrant farm workers in the fields and migrant camps and inmates in our local jail. Jesus sees two boats lying by the edge of the lake there at the jobsite of fishermen. We observe together that in contrast to the crowds “pressing around him and listening,” the fishermen are washing their nets. We imagine them off to the side checking out Jesus from a distance, a posture that most everyone I’m reading with can relate to. We soon learn that they hadn’t caught anything in spite of toiling all that previous night, making Jesus present there in the place of their shame. Jesus is next described as taking the initiative in moving closer to one of the fishermen, Simon. Jesus does this by physically entering deeper into his workspace, an empty boat—the site of his most recent failure. I invite someone to read Luke 5:3. People can easily see that this would be a big honor– to have Jesus ask you for your help, and to be able to use your boat and skills to help Jesus and to help your community hear Jesus as he teaches. We read on about how he sat down and taught, and then imagine the scene there before the whole crowd. “And when he had finished speaking, he said to Simon, “Put out into the deep water and let down your nets for a catch.” And Simon answered and said, “Master, we toiled all night and took nothing! But at your word I will let down the nets” (Luke 5:3-4 ESV). “How would you feel if you were Simon, being asked by Jesus to put down your nets in front of the entire community who had gathered to hear Jesus after having worked all night and caught nothing?” I ask the men, having noted the likely public nature of Jesus’ request for the first time. We discuss how Simon has just cleaned his nets after catching nothing, and how Jesus is asking him to get them messed up again. People mention the potential shame that Simon (and they) could easily feel to fish again after failing, and the utter disgrace they’d experience pulling up empty nets there before the whole community in full daylight– an embarrassing exposure of ineptitude. We discuss with the inmates how saying “no” to Jesus would bring disgrace before the community, and how Simon’s calling him Master (boss) and acquiescence “but at your word, I will let down the nets,” could show Simon’s accommodating hospitality or at worst a humiliating submission, even more than authentic faith. Simon lets down his nets before the onlookers on the shore, and we’ve only read Luke 5:5, so there’s anticipation as I ask someone to read the next verse. 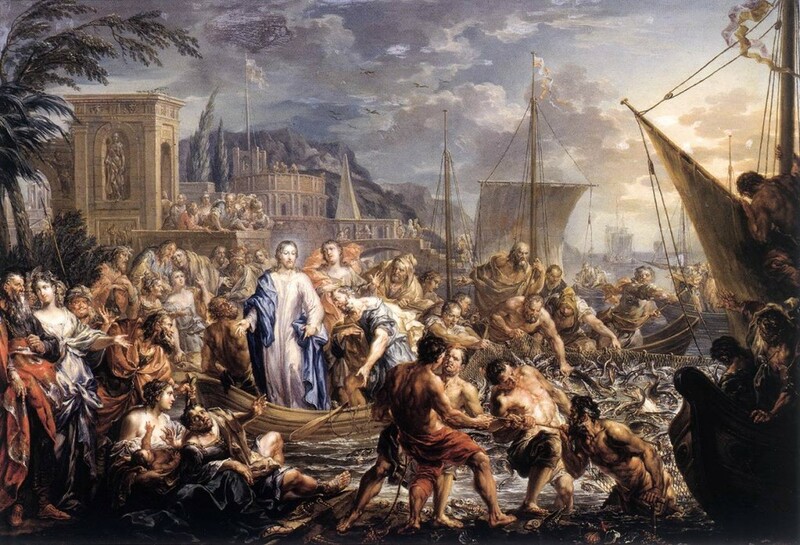 “And when they had done this, they enclosed a great quantity of fish; and their nets began to break; and they signaled to their partners in the other boat, for them to come and help them. And they came and filled both of the boats, so that they began to sink” (Luke 5:6-7). We note together how the text emphasizes that “they” let down the nets, and wonder if “they” includes Jesus and Simon, as there is no one else mentioned as being in the boat. However it looks like “they” refers to Simon and perhaps his assistants, as “they signaled to their partners in the other boat” to help them. They are described as filling the boats that nearly sink, and it looks like the text gives all the credit is going to Simon and his helpers. “How would you feel if you were Simon at this point, pulling up this enormous catch before the gathered public and your fellow fishermen?” I ask. The men all state that this would be hugely encouraging. Everyone agrees that Simon is experiencing public exaltation and vindication as a fisherman and a human being. Jesus’ presence with him and specific instructions empower him in his vocation, making him visibly successful and meeting his subsistence needs. Most importantly they bring healing to his shame. Everyone present can see how beneficial something like this would be for them right there and then. We look next with the inmates at Simon’s reaction to the amazing catch, and I invite someone to read Luke 5:8-10. Here we have the first mention that Simon is Peter, right at the moment when he saw the abundant catch, and fell down at Jesus’ feet expressing his unworthiness. We are getting to know him better as we hear his full name. “But why does he tell Jesus to go away from him because he is a sinful man? I ask. People respond that Simon Peter was feeling unworthy of such a big blessing. We discuss how he may have been afraid of his sudden success, and the men can all relate to this. “When you succeed in front of everyone you’re set up for a bigger fall. It’s better to stay down than to have visible success and then relapse or reoffend and lose everything,” a man states. Many of the men are in visible agreement. I suggest to the inmates that Simon Peter was possibly known in the community as a notorious sinner. We talk about how maybe Simon Peter knows that everyone watching him from the shore knows that he’s running a meth lab on the outskirts of Capernaum, or that he’s suspected of stealing car stereos or burglarizing houses to feed his drug habit, has done time for domestic violence or is a felon. Maybe Simon Peter can’t handle Jesus publically blessing him in his “sinful man” state, and knows that his neighbors probably are not excited for him. Does Jesus know who he is blessing? I invite someone to read on to see how Jesus reacts to Simon’s command that he leave. “And Jesus said to Simon, “do not fear, from now on you will be catching men” (Luke 5:10). There in the boat, through Simon’s enormous catch of fish, Jesus catches Simon Peter, James and John. These fishermen are won over by Jesus’ shame-removing ministry, and say “yes” to his full-on inclusion of them in spite of any perceived unworthiness. “And when they had brought their boats to land, they left everything and followed him” (Luke 5:11). The men in the jail bible studies and people in our Tierra Nueva community can see why the fishermen were drawn to Jesus and are themselves drawn to him. We summarize Jesus’ recruitment strategy as a way to remind ourselves what to look for now as we anticipate his fishing for us. We note first that Jesus takes the initiative, going to the margins of the margins—to the workplace there on the shore of the lake of Genesaret in Galilee. Jesus continues to take the initiative, stepping into someone’s workspace, which is a place of failure (Simon’s empty boat). Jesus approaches Simon needing his boat and asking for his assistance. Next Jesus asks his recruit to do something public that is difficult to refuse, inviting risky obedience that leads to public elevation and empowerment in his vocation. Jesus responds to push back (Simon’s unworthiness), addressing underlying fear and inviting him into something bigger (from now on you will be catching men). Jesus’ recruits leave everything to follow him. Jesus’ style of fishing is catching me again even as it caught Simon and John. I witness this Gospel story come alive in ways that catch inmates and people in our Tierra Nueva church. We pray together that our eyes would be opened to notice Jesus’ presence with us in our places of shame. May the Holy Spirit open our ears to hear Jesus’ shame-healing words and follow his call into a life of adventure as his disciples. May we learn alongside Jesus how to be agents of healing and calling in the places of failure of our world. We see the same thing with victims of child abuse. Psychiatric prisons also treat inmates as failiures as human beings, but Jesus saves !